It was only yesterday that Ford announced that it was bringing out a 2017 F-150 Raptor, an updated version of its off-road full-size pickup truck. Today, Ram is announcing its entry into that rarefied space — the 2015 Ram 1500 Rebel, which will reach the market a full year earlier. Neither of these trucks represent huge sales. (In the industry they are called halo vehicles.) They do give a manufacture bragging rights and and the ability to further showcase the capabilities of their vehicles in uniquely demanding situations. And, they are on the wish lists of many off-road enthusiasts. This one included. 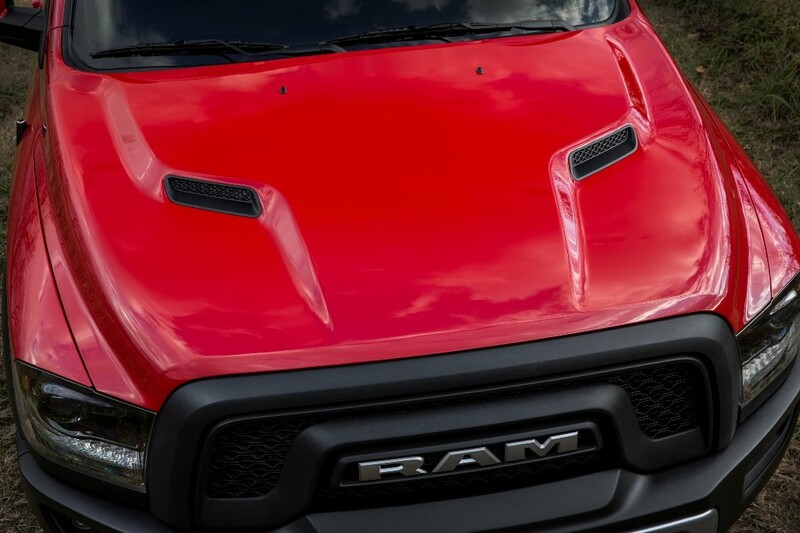 The Ram Truck Brand, a part of FCA US LLC.,the old Fiat-Chrysler, has developed dramatically over the past several years. Its full-size and heavy duty trucks have received numerous awards, including the NAIAS Truck of the Year two years in a row and the Truck of Texas, (Texas Auto Writers Association) the same two years for the Ram 1500. It was first to the market with a full-size diesel pickup, and has won high praise for its heavy-duty trucks and Promaster line of vans. In the recent past, however, the only way to have a Ram 1500 with all of the off-road bells and whistles was to modify it with aftermarket parts. With the introduction of the Ram 1500 Rebel, that changes. Available in fall of 2015, the pickup has its own look and capability. On the outside, the Rebel has its own look with a new blacked out grille and completely different off-road powder-coated front bumper with billet silver skid plate, front tow hooks and LED fog lamps. Bi-functional projector headlamps with LED marker lights and an aluminum, twin-snorkel sport hood. The black-out theme continues to Power Wagon (the Ram 2500 off-roader) wheel-arch moldings. Black is a design constant on the lower body, with a two-tone paint scheme and trail-ready accessories. 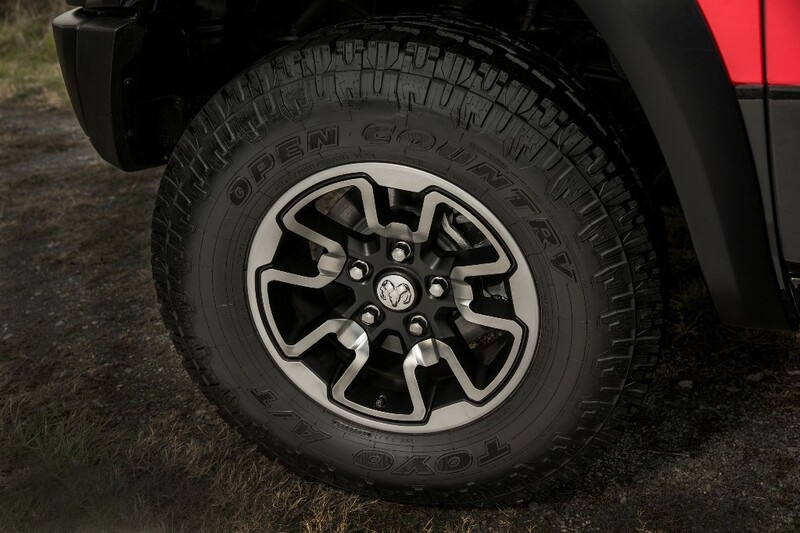 Unique 17-inch one-piece wheels are standard, mated to 33″ Toyo off-road tires. The powder coated rear bumper has flared cutouts around dual chrome-tipped exhausts, and rear lamps coordinated to the aggressive front end. The rear back-up camera is an option, but I feel it should have been standard equipment on a truck like this. Inclusion of a back-up camera will become mandatory soon across the board for trucks and cars, and — particularly with a vehicle that sits up this high — it seems like a no brainer. Perhaps Ram will take a fresh look at that before delivery begins. It would require no engineering changes and — on a premium truck like this — the bottom-line effect should be negligible. On the interior that attitude is again in full view. Seating was addressed with high-durability technical grain vinyl. This is an outstanding choice for this kind of truck although we don’t see it often. 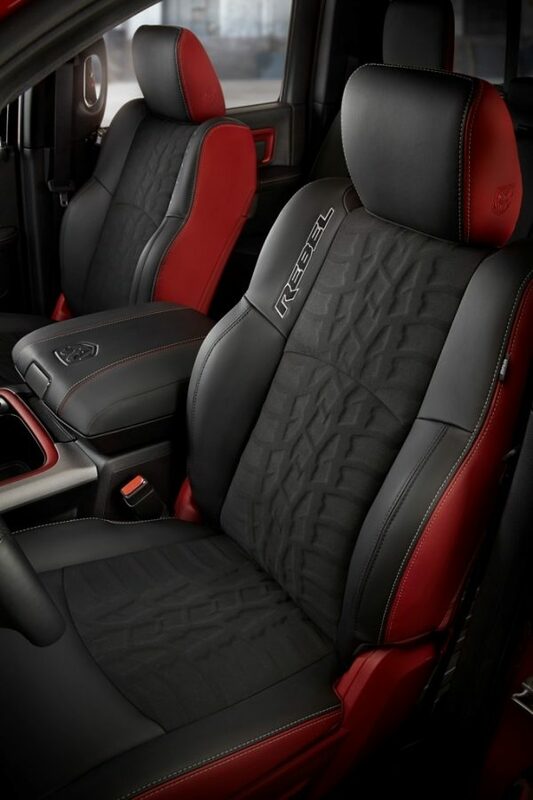 Seats feature Sedoso fabric inserts embossed with the Toyo tire tread pattern, matching the Rebel’s footprint. Heated front seats are standard and a black/red/gray theme is repeated throughout. 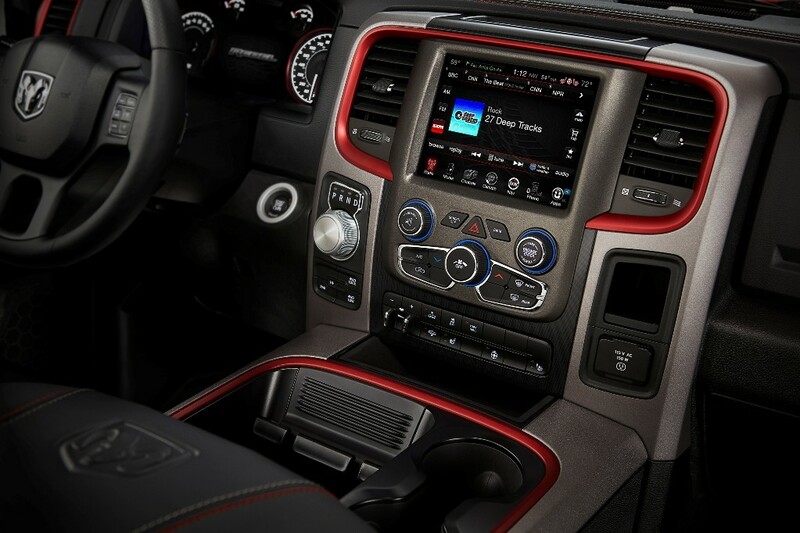 There is a rugged yet refined theme that carries over to the instrument panel, console and interior door panels. This may be an off-roader, but it’s going to look terrific getting there. There is a choice of two powertrains: the 3.6L Pentastar V-6 with variable-valve timing (305hp and 269 lb.-fit. of torque with fuel economy of 25mpg (for the first time, this award-winning engine will have a a 3.92 axle ratio), or the 5.7L Hemi V8 with 395hp and 410 lb.-ft. or torque. The Hemi-powered version will be available in 4X2 and 4X4 versions with 3.92 or 3.21 gear ratios. Both engines are mated to an eight-speed automatic transmission which has been an excellent performer on other Ram 1500 trucks. Available features include rear anti-spin differential, which turns both rear wheels in tandem when increased torque is applied. It automatically unlocks the differential fro normal on-road driving. The Rebel looks great, and the package makes it easier for a committed off-roader or wanna-be to get the right combination of accessories. 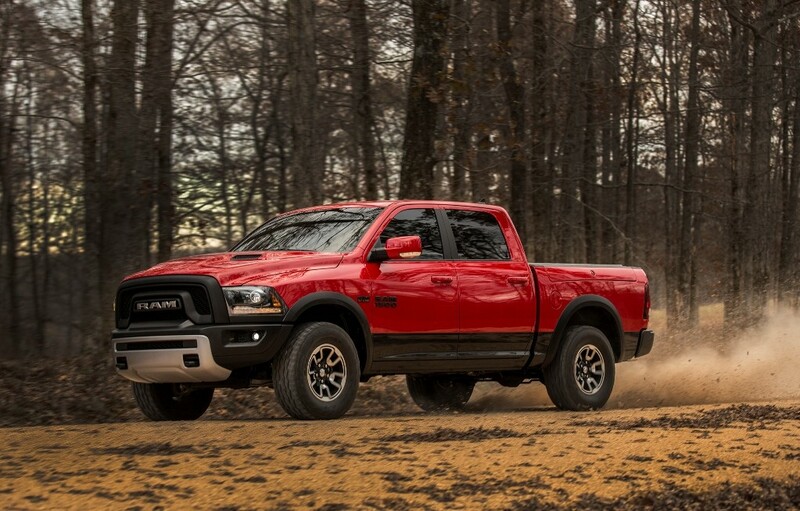 For lovers of the Ram 1500 and the Ram Power Wagon heavy-duty off-road truck this is a natural. Purists, I believe, will still wait for the more technologically advanced Raptor.